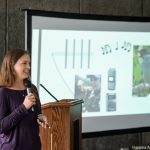 The goals of the project in Keaukaha go beyond scientific and clinical objectives—the main goal is to help the community and culture surrounding the loko i‘a (fishponds). This story is the fourth in a series on climate change research at UH Hilo. 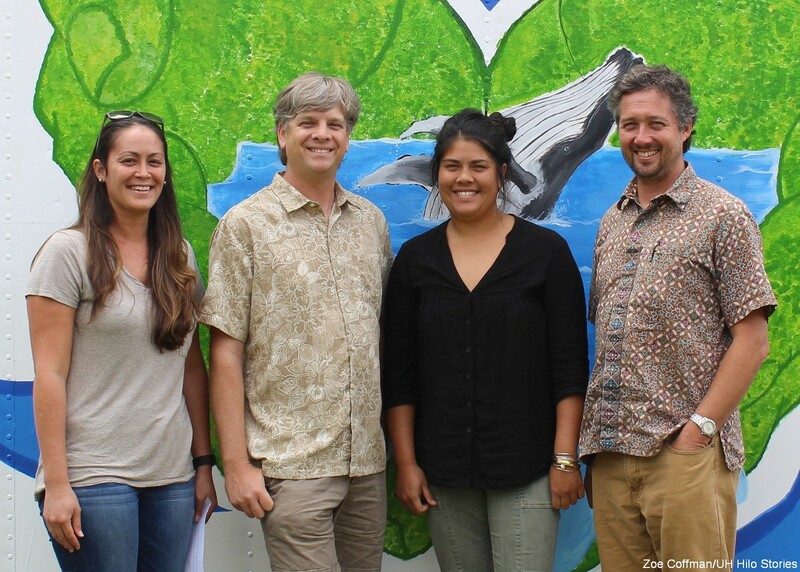 Research team (l-r) Cherie Kauahi, Steven Colbert, Kamala Anthony and Jason Adolf. 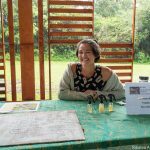 Research projects at the University of Hawai‘i at Hilo are more than opportunities for students to do applied learning, they are also often geared toward helping communities and culture in Hawai‘i flourish. A perfect example of this is a project run by Kamala Anthony and Cherie Kauahi, two UH Hilo graduate students, who have taken on loko i‘a (fishpond) research in Keaukaha, Hilo, with the help of two marine science faculty advisors, Steven Colbert and Jason Adolf. Aerial of fishpond in Keaukaha, now a subject of research conducted by UH Hilo. Click photos to enlarge. The project is aimed at studying current conditions in several fishponds in Keaukaha in order to restore, sustain and manage them better in the face of climate change. The research team is collecting baseline data from the fishponds—never before collected—to study how future climate change will affect the groundwater flow into the ponds. But the goals of the project go beyond the scientific and clinical objectives—ultimately the goal is to help the community and culture surrounding the loko i‘a. Members of the research team each have their own community connections to Keaukaha and a sense of obligation to help the loko i‘a and the local culture. Anthony and Kauahi are both graduate students in the Tropical Conservation Biology and Environmental Science program at UH Hilo and have a deep, personal connection with this research project beyond the student level. 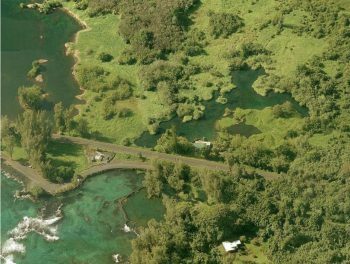 Aerial of Honokea fishpond at Richardson Ocean Park, Keaukaha. Kauahi was raised on Hawai‘i Island. She completed her undergraduate studies at UH Hilo and earned a bachelor of arts in marine science. She says her overall goal of this current project is to provide the people who mālama (care for) these places added information to continue to perpetuate loko iʻa pratices as well as to ultimately provide food for the people who depend on loko iʻa resources. 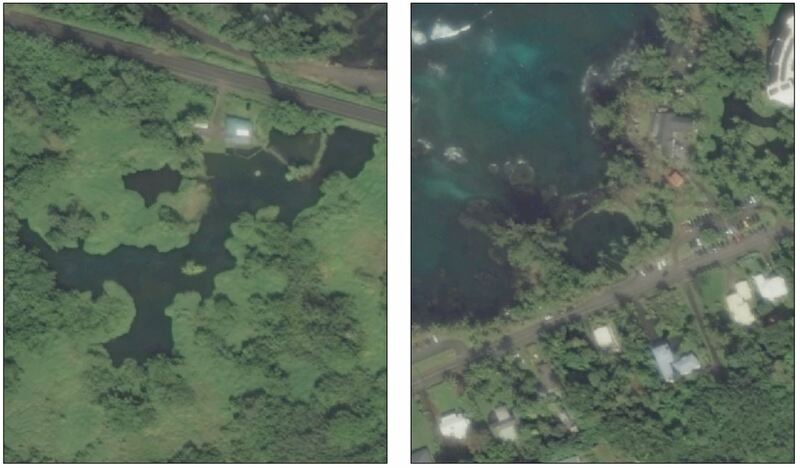 Aerials of road into Keaukaha with (left) Waiahole fishpond on mauka side of road and (right) Hale o Lono fishpond on makai side of road with wall of fishpond visible. Bing Maps. 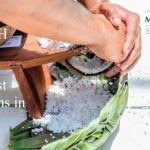 Both graduate students are taking away more than just the technical skills with their work on this project—rather they are learning how to join their passion for community and culture in Hawai‘i with the techniques and applicability of science. Project advisor Adolf, an associate professor of marine science, says he likes seeing students make the linkage between the two. “I’d like to see the scientific part be as meaningful as well as be interactive with the community and outreach steps,” he says. Adolf is originally from New Jersey. He received his master of science in botany from UH Mānoa and his doctor of philosophy biological oceanography from the University of Maryland. He worked on water quality in the Chesapeake Bay after gaining his PhD and made his way back to the islands in 2008 when he joined the faculty at UH Hilo. Because Adolf’s specialty is in water quality and phytoplankton, he is the faculty advisor on the current fishpond project. He has known Anthony for about five years and has watched her come up through her undergraduate program—he has seen her passion and focus on lokoi‘a restoration, which was part of his motivation to join the research team. Adolf says his favorite part about the research projects on campus is working with the students to help them write their thesis. Colbert, an associate professor of marine science, also serves as advisor for Anthony and Kauahi and helped write the proposal for this project because he has his own connections to the community of Keaukaha. Colbert is from Indiana and received his master of science in geology and doctor of philosophy in geology from the University of Southern California. While in California he studied groundwater hydrology in the coastal ocean, which is what he continues to do in Hawai‘i. 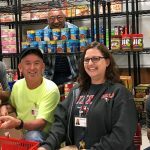 He joined the UH Hilo faculty in 2010 and has developed a deep connection to the ‘āina (land) and takes joy in giving back to a community that he feels has done so much for him and his students. 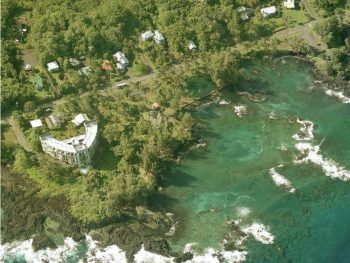 Funding for the fishpond research is from the Pacific Islands Climate Science Center at UH Hilo. The center is a partnership between U.S. Geological Survey and a university consortium that includes UH Mānoa (the consortium lead) and University of Guam, in addition to UH Hilo. She says she plans to continue the work she does with the loko i‘a restoration through a non-profit organization known as Hui Ho‘olei Maluo to support and guide loko i‘a restoration efforts. Although she is a first-year graduate student, Kauahi is already starting to plan for after graduation. She says she is looking to take a year off before possibly continuing on to earn her doctorate or she may immediately go to work protecting water resources. 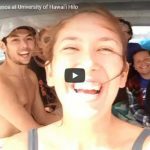 Applied learning for students is fundamental in research projects at UH Hilo—however, connecting classroom learning and field work to the communities outside UH Hilo is vital to the success of the students. This story was edited for clarification after further input from the students.